The Queen of Cups is a dreamer and a visionary. With a double aspect of the Water Element, one might be tempted to think The Queen of Cups is ruled by her fantasies and emotions. But she’s actually extremely stable and quite the doer. She can get things done like nobody’s business! Gemini one of the friendliest, most outgoing signs in the zodiac, knows exactly how nudge introverted Cancer out of his shell. When the vibe is just right, these two signs can accomplish wonderful things. This astrological combination is similar to that in the Three of Cups, although it is now more focused and mature. The large grey throne on the small island in the Queen of Cups tarot card contains the Queen’s fluid energy; she can only release it back into the sea. But if the Queen of Cups remains in it, the half dome in the shape of a sea shell promises that she will give birth to something beautiful. Note, that the square shaped sections in the Queen of Cups’ crown are engraved with nine circles each. That’s the number of months in the human gestation cycle. The Queen’s throne is carved with water spirits called undines. The undine on the right holds a fish, symbolizing spiritual gifts. Contemplating the cup in her hands, the power of the Queen of Cups’ vision transforms it into a temple guarded by two angels. Her visions are sacred. Oh, but spirituality doesn’t mean you can’t have fun anymore. Yes, the Queen of Cups’ white robe does symbolize purity. That’s because that the Queen has accepted the responsibility that comes with her position. Those wild party days in the Three of Cups had to end sometime. As the Queen of Cups cloak’s white and blue wave pattern shows, she has learned to trust her intuition. It has moved her to pursue spiritual things. Its red lining reveals that the Queen hasn’t forgotten how to have fun. But the Queen of Cups doesn’t feel the need to advertise her exploits to the world. In a reading, the Queen of Cups promises love, happiness, and success. Ruling by intuition and intelligence, she infuses every situation with vision, creativity, and compassion. If the Queen of Cups tarot card represents a person, it is someone who thinks with her heart. A nurturer and caretaker, she has an almost magnetic pull on small animals, children, and men. Her inner beauty radiates outward. No matter what her actual looks may be, others notice only beauty when they see her. Often, this inner beauty manifests itself as creativity. She may be an artist or a poet. More importantly, she knows how to bring art and poetry into her life. Is it any wonder, that she is surrounded by admirers? If you are in love, winning her heart will be no small task. As the embodiment of beauty and pleasure, she’s no prude. But note how the Queen of Cups’ throne with the beautiful, colored pebbles by her feet is on a tiny desert island. It’s not connected to the mainland, at all. If you want to be part of her perfect world, you have to earn your place in it. But once you’ve won her heart, she will give herself to you completely. You won’t find anyone who’s more loyal, devoted, and loving – a soul mate in the truest sense. On a broader level, the Queen of Cups tarot announces a time of overall happiness and emotional contentment. While the ocean is buzzing with activity, its waves are gently lapping at the sandy beaches of the island and the green shores in the distance. This mild climate spells success in all areas of life – especially ongoing projects. Expect very little inference and upsets, if any at all. Paying attention to your dreams will pay off in a big way. They will fill you with inspiration and creative energy. They could even be spiritual communications from higher levels of existence. When the Queen of Cups is reversed, she suggests that your independent streak is probably too wild for others to handle. She could also warn that you are spending too much time inside your own, private world. One thing is certain: You’re definitely marching to a different drummer! 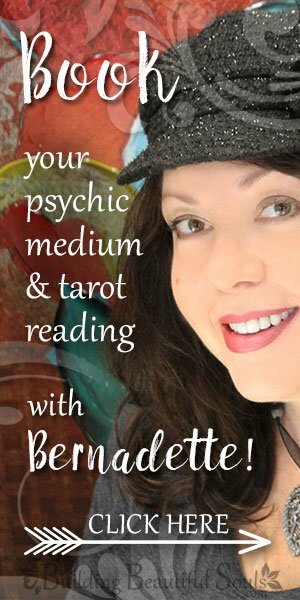 If the Queen of Cups tarot card represents you, then you’re quite familiar with all the things people say about someone who’s fiercely independent. You’re the square peg in a world of round holes. Others just don’t know what to make of you. They both admire and fear your unconventional way of living and thinking. “Some want to abuse you. Some want to be like you,” goes the song. If can live with this, that’s the stuff sweet dreams are made of. On the other hand, it can’t hurt to check whether or not others have a point when they say you’ve lost touch with the real world. Perhaps, you’re letting your imagination run wild with you for too long. That can create problems in your day to day life. Creative people and idealists often struggle with keeping a balance between meeting the demands of the real world and staying true to themselves. 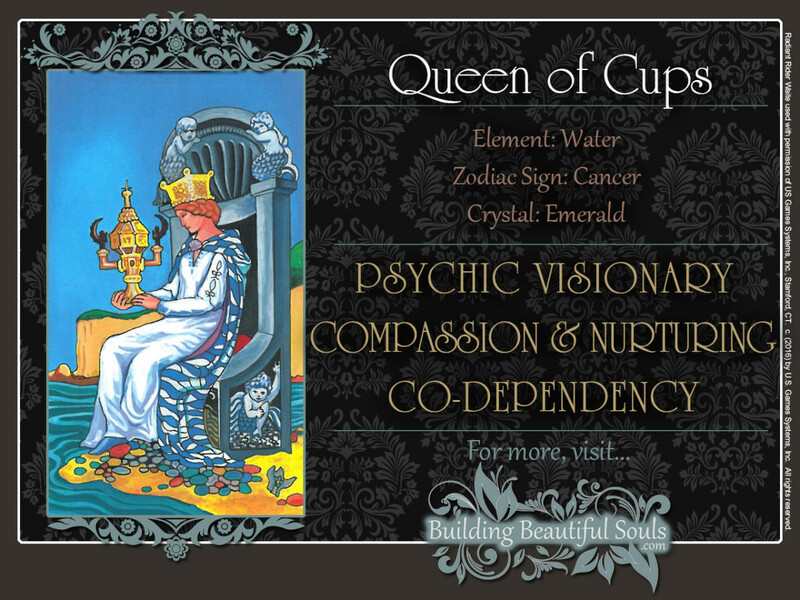 If the Queen of Cups card represents another person, it is often a fiercely independent woman. Like in the upright card, she is compassionate, kind, and alluring. But her free-spiritedness often alienates others. Her value system and world view often differ greatly from those around her. That’s why people tend to have a hard time trusting her. It’s not so much that she’s dishonest. However, her priorities are unique, to say the least. She may also be going through a period of transition, with many things being in a state of flux. So she may not be very reliable, no matter how much she’d like to be. If this is someone in whom you have a romantic interest, a passionate short to medium term involvement is quite likely. However, this person is not ready to settle down. Have fun while it lasts, but it’s not likely that this is your happily ever after. The numerological value of the Queen ofCups is the Number 3. Kabbalistically, this number is associated with Saturn, the eternal creator/destroyer. In traditional Numerology, 3 corresponds to Jupiter’s generosity and benevolence. When these energies combine in the element of water, they unleash tremendous amounts of creative energy.